England has had some truly woeful monarchs over the years. Ethelred the Unready somehow didn’t realise that paying the Vikings to stop every time they attacked his kingdom just encouraged them to do it again. Edward II was so busy hanging out with his lover, Piers Gaveston, that he lost most of his father’s kingdoms. King John was such a rubbish king that he unwittingly became a pioneer of democracy when his people got so sick of him that they made him sign the Magna Carta. King George III was utterly mad, but still reigned for 60 years. But of all England’s dreadful kings and queens, only one has the unlucky distinction of being tried and executed by his own people. That man was King Charles I (1600-49), and the English people hated him so much that they started a Civil War against him, cut off his head, and decided not to have a king or queen at all for the 11 years after his death. 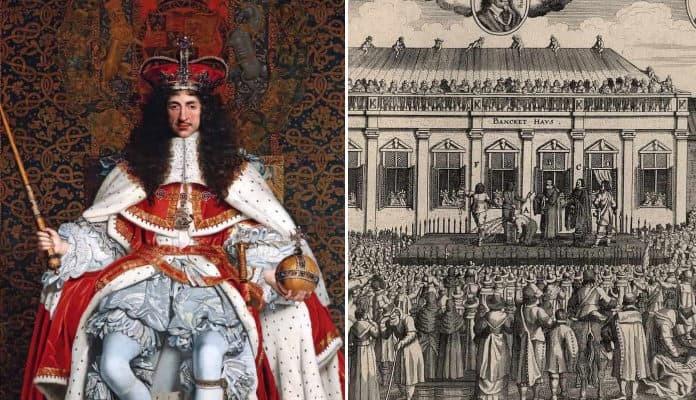 But was Charles really that bad, or were his subjects the real problem? Let’s find out by looking at the essential 20 facts about poor old Charles Stuart. 20. 17th century England was gripped by bloody debates over the Reformation. Charles lived in an especially turbulent period of history. In the 1530s, Henry VIII ended nearly 1000 years of Catholicism in England by bringing about the English Reformation, principally to divorce his aging wife and marry a younger one. We don’t need to go into the specifics differences between Catholicism and the new Protestant Church of England, but suffice it to say that the people were divided. They believed that which version of Christianity they were made to follow determined whether they went to heaven or hell, and so tensions ran extremely high. Reformation was revolutionary, bloody, and utterly divisive. Henry burned those who refused to give up Catholicism at the stake. When his daughter Mary I came to the throne, she changed England’s religion back to Catholicism, and went about burning prominent church reformers and ordinary Protestants who refused to cooperate, such as those above. Her successor, Elizabeth I, reverted England back to Protestantism again, and burned her fair share of stubborn Catholics. By the 17th century, the country was still divided: people on both sides had an axe to grind with their faith’s historic treatment, and firmly believed their version of Christianity was the only right one.